The Aussie dollar fell 0.38% in Asian session on Tuesday, following release of minutes of RBA's April meeting. Dovish tone from the central bank, which left the door open for rate cut if inflation remains low and slowdown in GDP offsets positive impact from improve in the labor market. 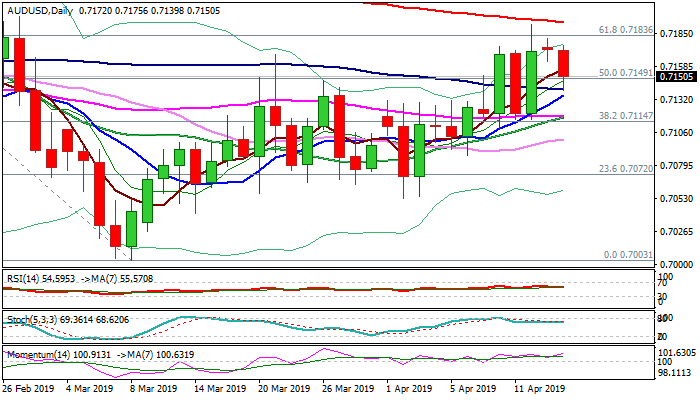 Fresh weakness emerges after bulls stalled on approach to 200SMA (0.7194) and failed to clearly break above 0.7183 (Fibo 61.8% of 0.7295/0.7003), with Monday's Doji adding to negative signal. Dip found footstep at 0.7140 (100SMA), but could extend towards pivotal support at 0.7118 (converged 20/55SMA's). Daily cloud is thinning and will twist next week that could also attract bears, however, bullish momentum remains strong and may limit bears. Ability to hold above 100SMA would keep in play immediate hopes for renewed attack at 200SMA, while further easing and violation of key 0.7120 support zone (Fibo 38.2% 0.7003/0.7192/converged 20/55SMA's would weaken the structure and risk deeper pullback.